Quietly sitting at home one evening last summer, watching the evening news and with computer games far from my mind, the peace was shattered when this platform game suddenly appeared on the screen. Startled with injured surprise that some upstart new company should dare to feature a new game on telly before letting CRASH know, all I caught of the item was that it had something to do with Arthur Scargill, flying pickets and a mole. It seemed trendily topical — another cheap bunch jumping on the games bandwagon with a rip-off idea timed to catch the miners’ strike? The company’s name was Gremlin Graphics. In the event CRASH wasn’t missed out. 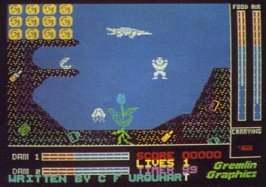 We got an early Spectrum version, doctored so we would could visit any room in case none of us were able to withstand the flying pickets or the infamous crushers, and thus we were introduced to the delights of Wanted: Monty Mole, and became acquainted with Gremlin Graphics, the company that won the 1984 CRASH Readers Award for the best platform game — far from a rip-off. That was in July. Gremlin Graphics has now been going for a year and it seemed time to visit Sheffield and find out how things were going. Alpha House, Carver Street is a gaunt Victorian office block that might once have been fashionable but now lies virtually, though tidily, empty. The Gremlins refer to it as ‘the prison’, an impression reinforced by the long, narrow corridors painted in institution maroon and cream. Gremlin Graphics has two rooms which for some obscure reason are situated high up in the building and quite some way from the ancient lift which no-one seems to use. When I spoke to Ian Stewart, Sales and Marketing Director, about the visit, he told me to stop outside a shop called Just Micro. This turned out to be a thriving and very busy computer shop which is owned by Ian and his partner Kevin Norburn, the Financial Director of Gremlin Graphics. A phone link between the shop and the office, soon brought Ian down to greet me and drag me away from the beeping, squawking screens that lined three walls of the shop’s interior. The corridors of Alpha House may have been prison-like, but once through the door and into Gremlinland, a different atmosphere pervaded. Of the two rooms, one is a general office, and the other, larger, room is equipped with desks, computers and screens for the in-house programming team. The programmers had gathered specially for my visit (more to give a third-degree on CRASH reviews than in my honour I suspected — the usual reason programmers want to talk to magazine people), and were busy falling over the ubiquitous C5, which seems to have taken over from the Porsche as a software house vehicle. I never did ask what it was doing up there on the third floor. The shop did get rolling and the first necessary programmers transpired in the form of Peter Harrap and Tony Crowther. Ian and Kevin were well aware from the start that they would have to put together a professional team to get safely off the ground. 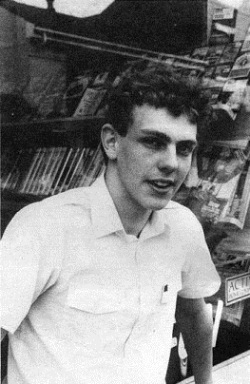 Tony Crowther, already well known for his Commodore programs Loco, Son of Blagger and Killerwatt, was made a company director and went on to write Potty Pigeon and Suicide Express for Gremlin before differences on the board led to his leaving the company. Looking around to ensure good distribution, Ian reckoned Geoff Brown of US Gold, who had just started Centresoft distributors was going to be a power and invited him to become managing director. But it was with young Pete Harrap that Gremlin really got going. 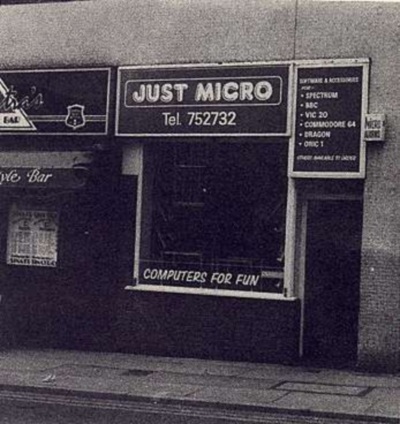 Where Gremlin Graphics started, the JUST MICRO computer shop in Carver Street, Sheffield. Gremlin’s offices are up above. With so many software houses finding themselves in a dodgy condition lately, I asked Ian what he felt about Gremlin’s position in the market after one year. On the Spectrum there are several planned releases kicking off with Beaver Bob (In Dam Trouble), followed by Grumpy Gumphrey — Supersleuth and Metabolis, and then onto October and the pre-Christmas release of Monty on the Run. In addition there are releases planned for the Commodore 64, some conversions and some originals, as well as games for the C16 and Amstrad, All of which must be keeping Gremlin Graphics very busy, and it seems that Ian is thumbing his nose at the traditional summer slump. 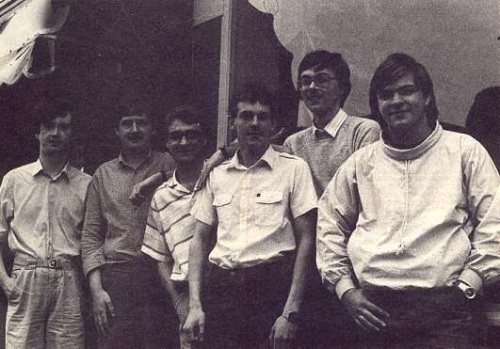 The Gremlins gathered: left to right, Shaun Hollingworth, Kevin Norburn, Ian Stewart, Chris Kerry, Peter Harrap and Christian Urquhart. With this sort of working flexibility, I wondered whether there was any sense of ‘team spirit’. Is he irritated when other companies try to jump on the success bandwagon of Monty Mole, or, as Software Projects has suggested, that platform games like Monty Mole are jumping on the success bandwagon of Jet Set Willy and Manic Miner? Chris wrote two more follow-ups to JATBS, Giant’s Revenge and The House that Jack Built. All these games featured heavily and brightly coloured backgrounds which distinguished them from almost every other program on the market. It was a trademark he kept when he moved over to Gremlin Graphics and produced the second Monty game, Monty Mole is Innocent. Chris is now finishing off Metabolis, which is a departure graphically for him. The way the character is used in the game is quite comical, and there are what Ian Stewart calls ‘some nice, silly little touches to it.’ You play one of the last human beings free of the evil influence of aliens that have taken over the planet and are turning people into monsters. You haven’t entirely escape the effects of their plans, however, being a bird with a still-human brain. It is a giant, colourful maze, full of hazards of course, through which you just guide your birdman until discovering the potion that returns you to a human form. Having once again become human, you still possess the abilities of a bird, so you can fly as well as walk. One of the nice little touches is the reference to infamous Gremlin crushers, but these do not kill you outright — they just flatten you for a while. Metabolis looks like being the most unusual program Chris Kerry has written. Shaun’s next project is a 3D version of a platform game, ‘like Monty Mole in 3D, but probably not Monty Mole.’ Meanwhile he is busy finishing Supersleuth, not the first ever program to be set in a Department Store (Herbert’s Dummy Run), but certainly one of the most frenetic. Grumpy Gumphrey is a store detective at (not surprisingly) Mole Brothers, an establishment with many departments on four floors. A central feature is the lift which may be directed to the desired floor by pressing the appropriate button. The lift is actually a ‘room’ which stands still while the floors whizz past. Shoplifters are abroad and it is Gumphrey’s principal task to apprehend them. If he makes a wrong decision about who it is, then a warning letter is issued and after three it’s the curtains dept. for Gumphrey. The frenzy sets in, however, not because of thieves but because of all the other jobs Gumphrey has to do. These include taking the manager his 10.30 cup of tea, recapturing gorillas escaped from the pet department, clearing ducks and bugs out of the food hall, finding lost babies (Herbert perhaps? ), fixing the lift when it breaks down, emptying the flooded boiler room, putting out fires in waste paper baskets and so on. All these jobs need specific tools which may be in obvious places or not at all — or they may have been stolen by shop lifters! No wonder Gumphrey is grumpy at times. When asked his age, Peter replied somewhat uncertainly, ‘Ooh, er, 20’. The son of a mining training officer, Peter studied at Sheffield University and was doing quite well until a Currah Microspeech unit decided to destroy his Spectrum and thus plunged him into a life of games designing. 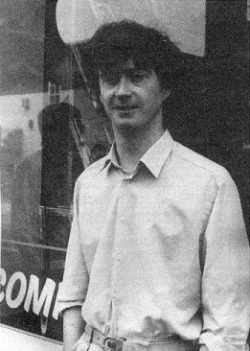 Like so many other young programmers, Pete started with ‘a little ZX81’ and then skipped a big ZX81 by selling some camera equipment to buy a Spectrum. He taught himself machine code programming on the 81 and ‘basically transferred that to the Spectrum’. 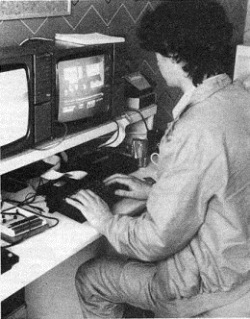 Until meeting Ian Stewart and Kevin Norburn in Just Micro, Pete used to do some hacking and design programs to alter existing games. His city redesigner for Ant Attack was sent back because Quicksilva told him they were already developing something themselves; although this never appeared, Zombie Zombie did allow the player to rebuild and change the city. Peter Harrap hit the headlines (literally) with his first game, the CRASH Readers Award winner, Wanted: Monty Mole. A wicked sense of humour was apparent in the game, and it is this angle that is most noticeable in the follow up. 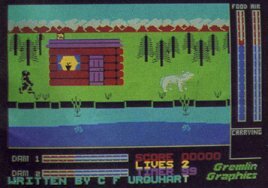 Apart from programming entire games, Pete is responsible for many of the Spectrum graphics in other Gremlin games, he has designed the main character in Beaver Bob, for instance. This led to some ribald comments on Bob’s suggestive style of walking — the irrepressible Harrap humour sometimes verges on the — well, naughty. Monty on the Run is the true successor to Wanted: Monty Mole. Like its forerunner, it is a platform game with many and varied elements. Perhaps the most significant is the fact that Monty can now somersault rather than just jump. 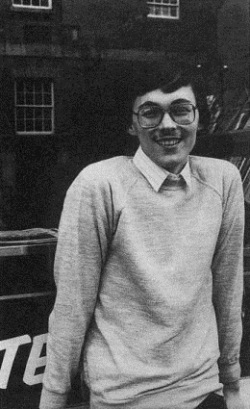 When asked whether the Commodore game Impossible Mission might have been a (forgive the pun) springboard, Pete just smiled. The story, as we know, so far: Monty Mole, suffering from a shortage of coal owing to the miners’ strike, enters a mine to steal some. After many misadventures he meets Arthur Scargill and is sent to prison for theft. His friend, Sam Stoat, has a go at rescuing him, but fails in the attempt, so Monty is left to complete his sentence. With time on his hands he takes to the prison gymnasium and becomes super fit, learning to somersault in the process. He gets out of gaol and tries to flee to Brazil. This is where the action of Monty on the Run takes place, as he boards a ship and tries to escape to France. Money is of the essence, and fortunately there are gold sovereigns to be collected, but in order for the ship to sail, Monty has to perform several tasks, all of which require the right tool for the job. On top of that there are hosts of malcontents trying to stop him. The ’orrible ’arrap has programmed in numerous devious traps, some of which are so mind-bogglingly cruel it’s mind-boggling. There are lifts with nasty habits, teleport beams which are only safe if they are a certain colour and some of which can deposit you in a lethal situation. Objects to be collected are placed in almost impossible positions, and often, after hours of trying to reach them, they turn out to be useless or, worse still, positively dangerous. This is not a game for the squeamish! Peter, who is quietly spoken, tends to a calmness that is belied by the mischievious delight he takes in setting the hapless player up for a pratfall. But I’ve no doubt that thousands will be queueing up for a custard pie in the face by October when Monty on the Run is released. Christian, now 19, moved to Manchester to join Ocean, and then onto Sheffield with Gremlin Graphics. His first program, Transversion was a fast grid game which Ocean marketed. 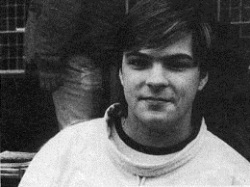 Afterwards he became an Ocean in-house programmer and worked on Hunchback, Cavelon and Daley Thompson’s Decathlon. Since joining Gremlin, Christian has been working on Beaver Bob in Dam Trouble, which was the subject of a loading screen competition run in CRASH. CRASH readers who visited two of ZX Microfairs last year, will probably remember seeing Christian on the CRASH stand, holding court with gamesters wanting to know how to win at Hunchback, and having a programmers’ battle with David Shea (Quicksilva Frenzy and Snowman, who now works at Mikro-Gen). Beaver Bob in Dam Trouble is described by Ian, as a game for the slightly younger player, which isn’t to say that it’s easy. Above the surface of the river, stands a wooden hut with several floors. This platform section of the game sees Beaver Bob collecting dynamite. Below the surface of the river are the beaver’s two dams, and a secret hideaway where he keeps food and is able to take a breath. The river is infested with crocodiles which not only eat beavers, but also steal dam logs. The object is to replace the stolen logs to keep the level of the reservoir up, whilst avoiding crocodiles, schools of piranha and hunting scuba divers.